*Originally reviewed on my first blog, readlistenreview.wordpress.com. It has been interesting over the past week to see how I have grown as a reviewer over the past two (2) years. I can only imagine that I’ll continue to hone my craft over the next several years and I hope that you guys continue to love my reviews! I will say this though: this book still holds a special place in my heart. It introduced to me to the Grimdark sub-genre of Fantasy which has quickly become my favorite to read. It has also allowed me to be Fletcher’s alpha/beta/gamma reader over the past couple of years and all I can say is that you guys are in for some awesome reads. I have to lead with one thing: this was one of the best books I have read in a long time and is my #1 read for 2016. No other novel this year has grabbed me from page 1 and killed more hours in a day than BR. The characters are vastly different than any I have come across and the story is so unique that only a delusional man could’ve come up with it. Well, Fletcher is that guy. If you like Grimdark and haven’t read this book, you need to change that ASAP. The journey begins with three scoundrels who go from town to town looking for a quick buck. You have Stehlen, a kleptomaniac who only lives to serve herself, though there is another whom she secretly loves but outwardly hates. Then there is Wichtig, the self-acknowledged “Greatest Swordsman in the World” who travels from town to town challenging their mightiest warriors to spread his name and fame amongst the people. Lastly you have Bedeckt, a warrior past his prime and … beyond redemption in his own eyes though he still has plenty to live for. As the band of unknowns bound from shanty town to defunct city, they hear of a delusional High Priest by the name of Konig who is building the hope and belief of his people for an ultimate goal: to create a God out of a young boy named Morgen. Since they would like to have an early retirement and a huge payday could manifest that day sooner, they advise a plan to steal this soon-to-be God from Konig’s grasp. But these three aren’t the only ones with who want Morgen. Konig’s delusions are manifesting themselves and becoming stronger by the hour, crippling Konig’s sanity and developing their own ideas in the process. In a land full of shape-shifters, pyromaniacs, assassins and mirrorists, our three “heroes” begin to understand that they may have underestimated just what Morgen can do, and it may be too late to turn back. And not only that, they aren’t the only ones who have plans for the boy. There are plenty of crazies on their trail that will stop at nothing to gain what the boy possesses. As I stated in the beginning, this was my favorite reads of 2016. I read around 100 books/novellas a year, so that is definitely saying something. Fletcher has quickly joined the ranks as one of my favorite fantasy authors, including Mark Lawrence, Michael Sullivan, Patrick Rothfuss and George R R Martin. 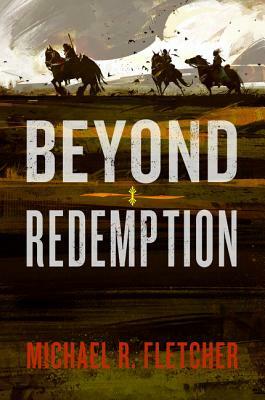 Pick up Beyond Redemption and let me know what you think. I loved this book, it was absolutely bonkers but intelligent at the same time. Definitely not for everyone, but a must-read in the right circles. One of my favourite books, period. A totally underrated book and author! I love anything Fletcher writes! I wish I could like this status more. So much truth!